Sony BRAVIA XBR-65X850F 65" 4K UHD HDR 120Hz (960MR) LED Android Smart – SaleCanada Inc. The Sony 65" X850F is a 4K Android Smart TV that uses the 4K HDR X1 processor and features Sony's TRILUMINOS Display to produce images that are crisp, vibrant and truly lifelike on this massive display. You'll also have access to Google's arsenal of features, from Google Play apps to Google Home, for the best media experience technology can offer. 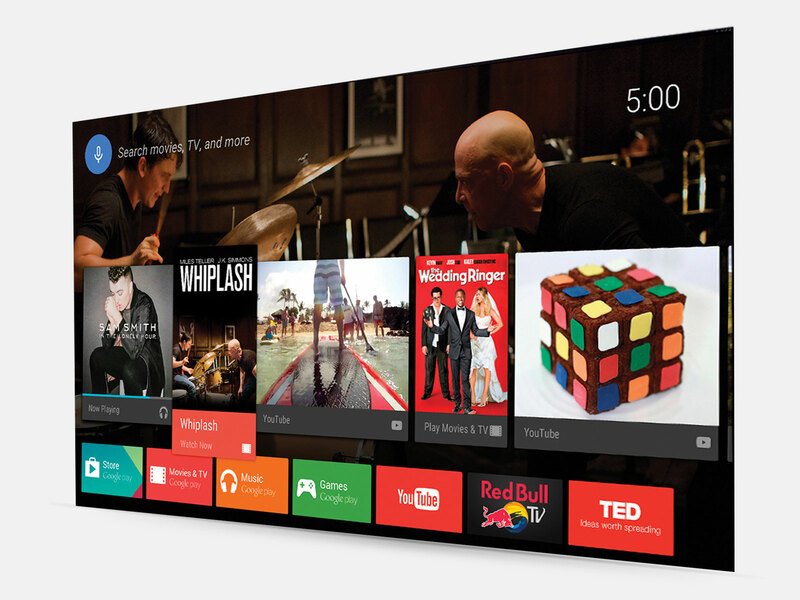 Increasingly, TVs are meant to blend seamlessly into our homes. No longer big, dark pieces of furniture that dominate a room, now TVs are almost all screen with no frame or bezel, and they’re meant to look sharp and integrate a variety of programming into your home and your life. Sony’s new Bravia line takes this sentiment to heart. 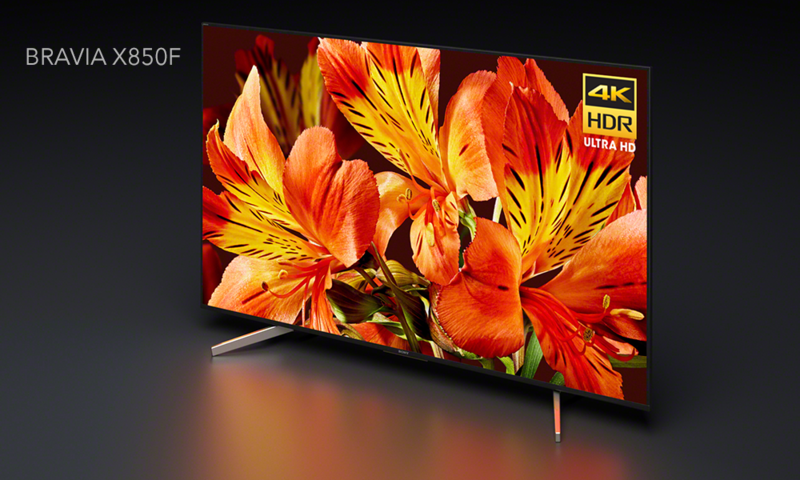 Sony’s X900F offers stunning 4K resolution plus HDR colour and sharp contrast. Similarly, the X850F stands out because of its breathtaking colour and sharp 4K HDR clarity. Sony’s X900F has a wide array of sizes: choose 49”, 55”, 65” ,75”, and 85” so you can more easily integrate your TV into your particular space. 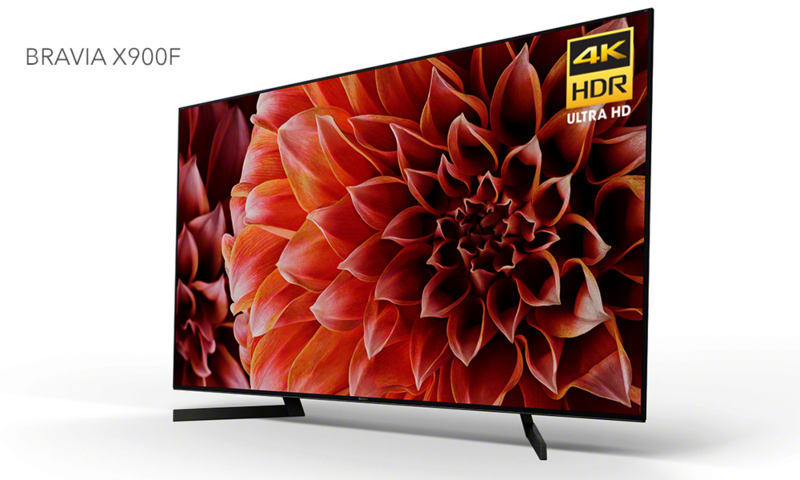 No matter which size you choose, you’ll get amazing Sony technology: a X1 Extreme Processor, and X-Tended Dynamic Range PRO 6X, plus X-Motion Clarity so the Sony X900F 4K HDR TV displays an awe-inspiring 4K HDR¹—a picture with stunning clarity, contrast, and colour that you won’t be able to tear yourself away from. Sony X850F comes in 65”, 75” and 85” sizes, and lets you take even non-native HDR content to the next level. It automatically improves the look of your video with an X1 processor and 4K X-Reality PRO software, and Sony’s legendary TRILUMINOS colour display. Sony’s High Dynamic Range (HDR) will change the way you look at TV. Combined with 4K Ultra HD resolution, HDR video content delivers exceptional detail, hyper-realistic colour and contrast, with a far wider range of brightness than other video formats¹. The result is the most lifelike picture TVs have ever been able to create, with brilliant highlights, true and natural gradation, and superfine detail. With Sony’s full-array local dimming technology, found in the X900F, you get enhanced contrast and incredible brightness in a slim design. This technology more accurately balances light output across the screen so you’re not getting harsh bright spots or blacked-out areas. Thanks to Sony’s X-tended Dynamic Range™ PRO 6x you’ll see six times the contrast range of a conventional LED-edge lit TV meaning it’ll look more like you’re watching what’s happening outside a window, than staring into a TV set. If you don’t have access to as much HDR content as you’d like, you can count on your Sony Bravia TV to help you. Sony’s new X1 processors take even non-HDR content to near 4K HDR quality¹. How? Sony’s Object-based HDR Remaster technology can detect, analyze and optimize each object in the picture individually then adjust the overall contrast for a more natural and realistic picture on screen. And you don’t need to do a thing! When it comes to the X900F you’ll be upgrading to the newly developed 4K HDR Processor X1 Extreme. It has the power to enhance video right before your eyes for a more realistic and immersive viewing experience. 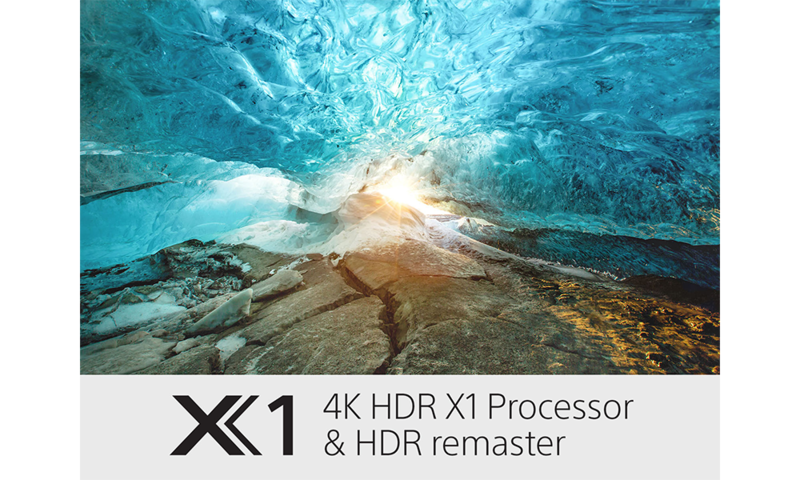 The 4K HDR Processor X1 on the Sony X850F outperforms Sony’s original 4K Processor X1 with more real-time image processing power. Now you don’t need an external streaming device to access all the online content you want. From movies and TV shows to thousands of apps including your favourite Android games, Sony’s Android™ TV brings you everything quickly and easily2. Cast your favourite apps with Google Cast3 or enjoy a huge range of apps from Google Play™, including YouTube™, Netflix, and Amazon Video. And with Google Home compatibility4, you can talk to your smart home digital assistant and have it voice-control your TV. It’s the ultimate smart home integration! Just ask your Google Assistant to do things like cast, search and play videos from YouTube, and you don’t need to touch a remote control. 1. 3,840 x 2,160 pixels. Requires HDR compatible content from supported streaming services, such as Netflix and Amazon Video. 2. Broadband speed of at least 2.5 Mbps recommended for SD services, 10 Mbps for HD streaming or 4K downloads, 20 Mbps for 4K Ultra HD streaming. Wireless connectivity requires 802.11 home network (802.11n recommended). Network services, content, and the operating system and software of this Product may be subject to individual terms and conditions and changed, interrupted or discontinued at any time and may require fees, registration and credit card information. 3. Requires compatible devices connected to the same network. Google Cast requires mobile devices with Android 2.3 or higher, or iOS 6.0 or higher and Chromecast application. Google Play using Android TV Remote Control application requires Android 4.0 or higher; not available for iOS. Voice Search is available using the included remote control, Android TV Remote Control application with Android 4.0 or higher, or using Sony’s TV SideView application available for Android 4.0.3 or higher or iOS 7.0 or higher. 4. Google Home device (sold separately) compatible with Sony TV’s powered by Android TV. Requires compatible devices connected to the same wireless home network. Download the Google Home app from the iPhone App Store or Google Play. Subject to third party app terms and conditions. User must link compatible devices in order to control operation. Once download is complete, the Google Home feature may be connected to the Sony device to access the voice control function. Amazon Alexa device (sold separately) compatible with Sony TV’s powered by Android TV. Works with voice-enabled remote controls. Subscriptions may be required to access certain content. © 2018 Sony Electronics Inc. All rights reserved. Reproduction in whole or in part without written permission is prohibited. Sony, X-Reality, Motionflow, TRILUMINOS and the Sony logo are registered trademarks of Sony Corporation. HDMI is a trademark of HDMI Licensing LLC. Android, Android TV, Google Cast, Google Play, Google, Google Home, YouTube and the Google logo are registered trademarks of Google Inc., used with permission. Amazon Echo is a trademark of Amazon Technologies, Inc. All other trademarks are trademarks of their respective owners. Features and specifications are subject to change without notice.